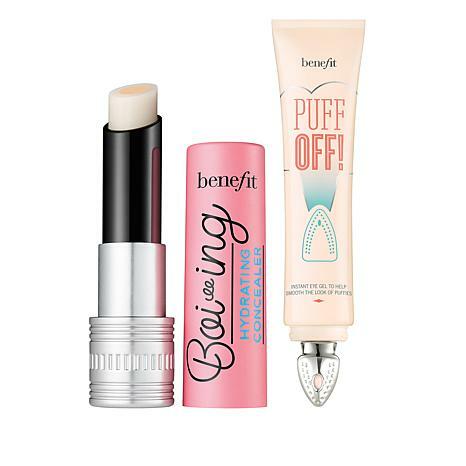 Conceal and decrease the look of puffiness instantly with this two-piece under-eye set from Benefit Cosmetics. Translucent peach shade dries colorless on skin. 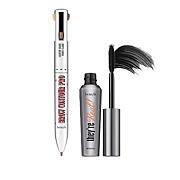 Benefit Boi-ing Hydrating Concealer Shade 1 Light .12 oz. Ingredients: RICINUS COMMUNIS (CASTOR) SEED OIL, C12-15 ALKYL BENZOATE, POLYETHYLENE, CAPRYLIC/CAPRIC TRIGLYCERIDE, ETHYLHEXYL PALMITATE, CETEARYL ISONONANOATE, NYLON-12, SILICA, PHENOXYETHANOL, CAPRYLYL GLYCOL, TOCOPHERYL ACETATE, BENZOIC ACID, ETHYLHEXYL MYRISTATE, ETHYLHEXYL STEARATE, HEXYLDECANOL, BUTYLENE GLYCOL, PYRUS MALUS (APPLE) FRUIT EXTRACT, BRASSICA CAMPESTRIS (RAPESEED) STEROLS, BHT, TOCOPHEROL. [+/-: CI 19140 (YELLOW 5, YELLOW 5 LAKE), CI 42090 (BLUE 1 LAKE), CI 77007 (ULTRAMARINES), CI 77163 (BISMUTH OXYCHLORIDE), CI 77491, CI 77492, CI 77499 (IRON OXIDES), CI 77891 (TITANIUM DIOXIDE)]. 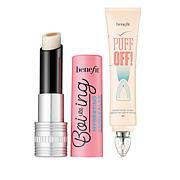 Benefit Puff Off! Instant Eye Gel .34 fl. oz. Ingredients: Aqua (Water), Isohexadecane, Nylon-12, Hydrogenated Polyisobutene, Isododecane, Butylene Glycol, Silica, Sodium Acrylates Copolymer, Glycerin, Alumina, CI 77891 (Titanium Dioxide), Sodium Acrylate/Vinyl Alcohol Copolymer, Alcohol Denat., C13-15 Alkane, Ci 77163 (Bismuth Oxychloride), Caprylyl Glycol, Helianthus Annuus (Sunflower) Seed Oil, Phospholipids, Polyglyceryl-10 Stearate, Sodium Acrylic Acid/Ma Copolymer, Phenoxyethanol, Polysorbate 20, Hesperidin Methyl Chalcone, 1,2-Hexanediol, Menthoxypropanediol, Steareth-20, Parfum (Fragrance), Sodium Citrate, Hexyl Cinnamal, Potassium Sorbate, Geraniol, Linalool, Tocopheryl Acetate, CI 19140 (Yellow 5), CI 16035 (Red 40), Dipeptide-2, Limonene, Citronellol, Citric Acid, Palmitoyl Tetrapeptide-7, Sodium Chloride, Hexylene Glycol, BHT, Tocopherol. This Really helped my darkCircles and puffiness! The Bong really takes the dryness away !
. Sorry i sent it back. ! Ordered the light one but it was still very dark and creased . And what is the puff off supposed to do ? Didnt do a thing but glob out , sorry ! What has happened to benefit now even , they are real flakes off now . Sorry HSN are you selling old products? Last tube of mascara was dry and flaky . Sorry Im done with that one . I'm definitely in agreement with others about this duo. The Puff Off's not bad - not that great either - but the concealer is very poorly designed. 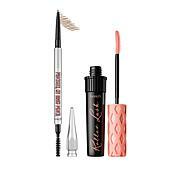 I wanted it because I have very dry skin and very dark circles, so I wanted to use this on very light makeup days. The main problem is that there is WAY too much moisture and not nearly enough concealer. It just makes your eyes greasy and the concealer crease badly. I wish I had returned mine in time. I wanted to really have the Puff Off work for me, but it was not to be. I have dark circles and it didn't help me with that. The Boi-ing I've used before, it's ok, but it doesn't have the best coverage either. I will be returning this set.